As a comic book fan I've been meaning to see Kevin Smith's films for years. I finally got started over the weekend with Chasing Amy, his 1997 romantic comedy starring Ben Affleck, Joey Lauren Adams and Jason Lee. The movie's entertaining, but I couldn't buy the premise at all. Affleck plays Holden, a whitebread comic book artist who falls in love with another artist named Alyssa (Adams), despite the fact that she's a lesbian. Though Holden's best friend Banky (Lee) explains to him the utter futility of hoping to convert her, he tries anyway. 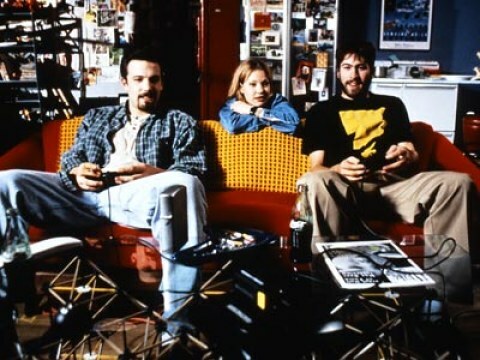 Despite all that, I thought Chasing Amy was odd enough to be charming. Smith's got a great feel for dialogue and Lee is terrific as the obnoxious best friend. I just think the movie should have given lesbianism a fighting chance. Dude, she only hooks up with that dude for a couple of months. In the beginning, she's with a chick. In the end, she's back on the muff. Lesbianism is the winner in that movie.